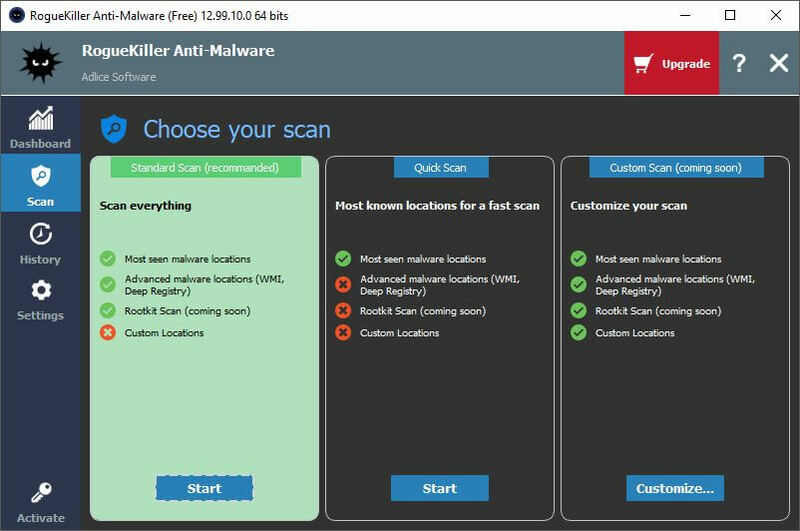 Scan engine will list all malicious items on a machine, performing Anti-malware analysis on them. Multiple scan modes can be chosen according to the depth needed. Scan depth will also affect the run time. Before starting a scan, you need to choose what mode to use. Standard mode is the preferred mode, it scans everything using internal rules to optimize the run time (~30 mns). 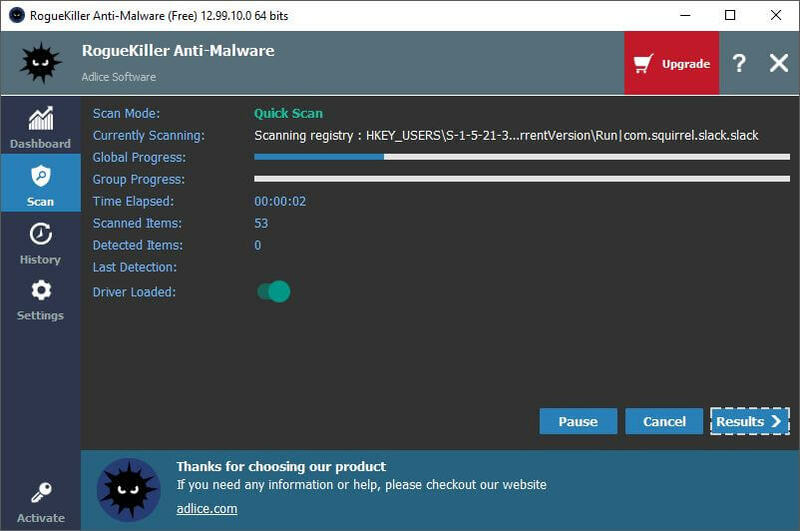 Quick scan is the fastest mode (~1 mn), it will scan only the most probable locations for malware infections. Custom scan is a standard scan with extended choices: You can choose to disable some modules and to add custom filesystem locations. Once the mode is chosen, hit the “Start Scan” button. While a scan is in progress, you can watch the progress and pause or cancel the scan. You can also know what has already been found by looking into the “Results” tab. During a scan, no element can be selected or modified. After the scan finished, you can inspect and choose the elements to remove in the results tab. Select or deselect the items to your needs, and hit the “Removal” button to start removal. 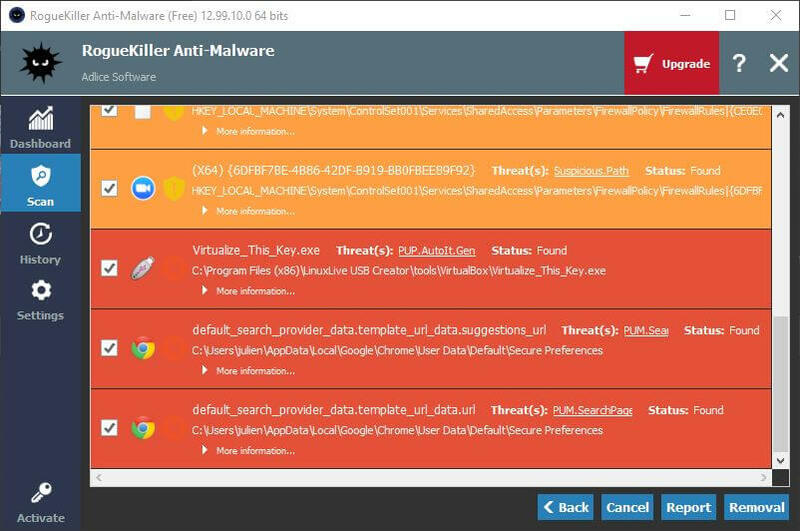 After a removal, only selected items are displayed and their status is updated with what the engine did with them. The Removal report is also made available with the “Report” button. Click on “Finish” button to return to the main panel.